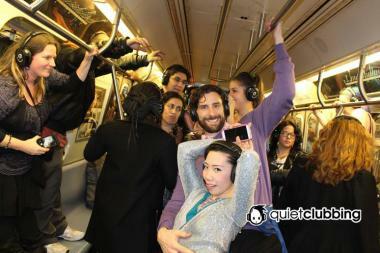 MIDTOWN — These straphangers aren’t dancing on the subway for money — they’re doing it for fun. 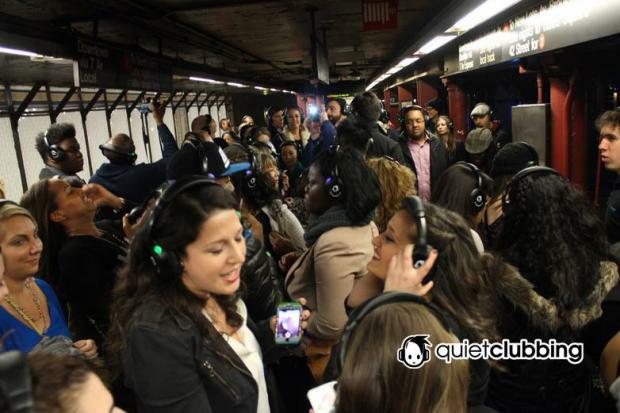 Quiet Events, a year-old company that organizes "silent" dance parties at clubs in the city, is now bringing the same experience to the city's subways, distributing wireless headphones so participants can be part of exclusive parties held in plain sight. “It’s a mix of a guided tour, flash mob, dance party and a pub crawl, for those that are native [New Yorkers] to those just visiting,” said William Petz, founder of Quiet Events. Despite the company's name, the only thing quiet about these monthly City Party Tours is the music. The 100 participants descend on the subways as a group, singing, dancing, clapping and shrieking to songs only they can hear. “People have no clue what’s going on when [they see] 100 people with headphones singing and dancing to music as if they were in a karaoke bar or dance club,” said Petz, a 34-year-old College Point resident who works in finance technology. The headphones have channels that tap into different playlists — including Top 40, '80s and '90s music, hip-hop and R&B — and they light up with a designated color for each playlist so participants can easily tell what other members are listening to, Petz said. The headphones are also synced to a tour guide's mic — so the guide can share interesting subway facts, practical instructions about where to go and fun orders like telling everyone to jump at the same time. The dancing flash mob lasts for three to four hours and costs $35 per participant. The tour begins with drinks at Amigos bar, at 2888 Broadway, near the 1 train's 110th Street station. The tour then hops to several subway lines, making stops at Grand Central, Penn Station and Bryant Park, Petz said. The next City Party Tour will take place on Jan. 25 from 8 p.m. to about midnight. Tickets can be purchased online at quietevents.com/event/subwayparty_jan.